Between towns of Liptovský Mikuláš and Liptovský Hrádok, on the left shore of the Váh river, one can find the Jánska valley, one of the most beautiful places of the Liptov region. The quaint historical village of Liptovský Ján is situated before the entrance to the valley. The oldest historical records of the village come from 13th century (Vesverez village in 1286, Zent Iwan village in 1358, Zentyan village, Zentyuan village, Sendywan village, Zentiwan village in 1380, S. Johannes village in 1386, Swaty Jan village in 1471, Zent Janus village in 1479, Swati Janszky village in 1515, Swatý Ján village in 1773, Liptovský Svätý Ján village in 1927, Liptovský Ján village since 1960). It is a gateway to the unique world of history, architecture, protected animals and plants, thermal waters, tourist pathways, hunting, fishing and caves and abysses, when the sun never shines. The village of Liptovský Ján and twenty objects here have constituted a protected area since 1991 and Jánska valley has been a watering place since 1998. There are many opportunities – thermal mineral springs during the summer or snow-covered slopes in the winter. If you are searching for the untouched beauty of the nature and the endless silence of mountains, you are at the right place. 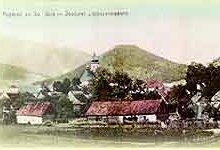 The long history of the local gentry left marks on the village of Liptovský Ján, too.